The Winter Hoot is held indoors with film screenings and live music in the Performance Hall, an upstairs Kids Zone, food in the Dining Hall, and intimiate mini-concerts in the Pewter Shop. The Blacksmith Shop is also open during Saturday afternoon. When you arrive, follow parking signs and proceed to Esopus Lodge to check in or purchase tickets, put on your wristband, and enjoy the weekend! The Summer Hoot is held outdoors with live music on two side-by-side stages, kids activities down the hill at the kid's zone, and food and crafts in the vendor village. Blacksmith demos will be ongoing in the Blacksmith shop, intimate musical mini-concerts will be recorded and filmed with a live audience in the Pewter Shop, and you can explore our trails, visit the historic covered bridge, or hike to the dramatic Cathedral Gorge. See site map below! 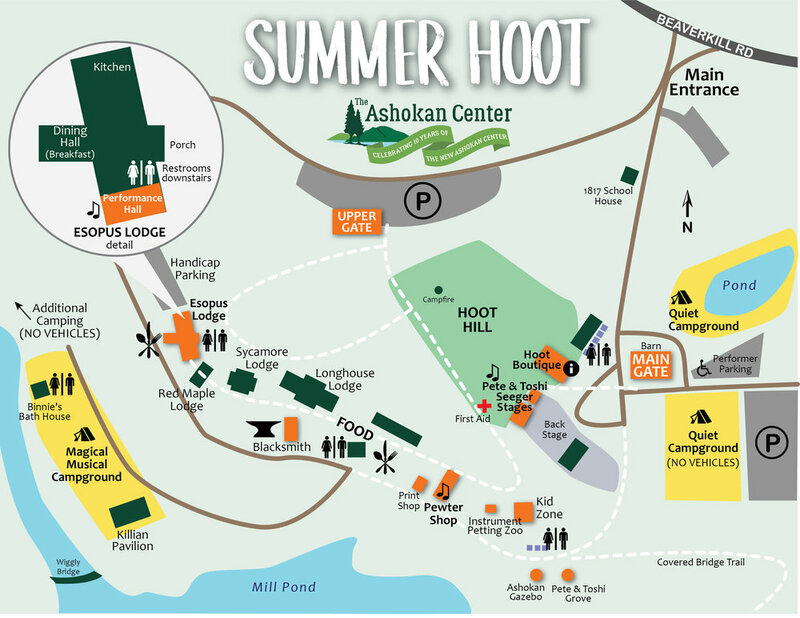 When you arrive, follow parking signs and proceed to the Main Gate at the red barn to check-in or buy tickets… and get your Hoot on!